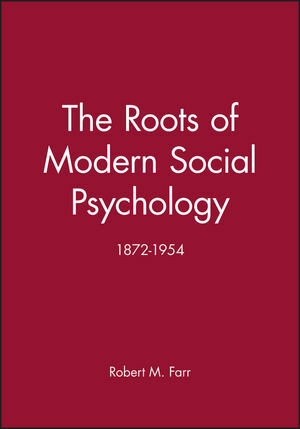 This volume traces the origins of social psychology in both the European and American traditions of thought, and seeks to place modern social psychology in its historical setting. Robert M. Farr is Professor of Social Psychology at the London School of Economics and Political Science. 1. Modern social psychology: a characteristically American phenomenon. 2. The emergence in Germany of psychology as a natural and social science. 3. The psychology of the masses and of culture. 4. George Herbert Mead: philosopher and social psychologist. 5. The Murchison Handbook of 1935: a truly comparative psychology. 6. The individualisation of social psychology in North America. 7. Sociological and psychological forms of social psychology. 8. Ancestors and founders: reconstructing the past. 9. War and the history of social psychology. 10. The long past and the short history of social psychology. Appendix I: Some significant dates in the emergence of psychology as an experimental and social science 1872 - 1937. Appendix II: The rubric for Paper V of the University of London Examinations in Psychology in the early 1960s. Appendix III: Reviewers comments on The Long past and the Short History of Social Psychology. Inter-disciplinary in that it provides a framework for understanding sociological as well as psychological forms of social psychology.